The Port Pirie Motorcycle Club ran a once a year picnic meeting at the Mannahill Speedway. The cinders track hosted motorcycle and compact speedcar racing. Brian Davis in the thick of it. Photo's: possible from Brenton Talbot or the Jamestown Historical Society. 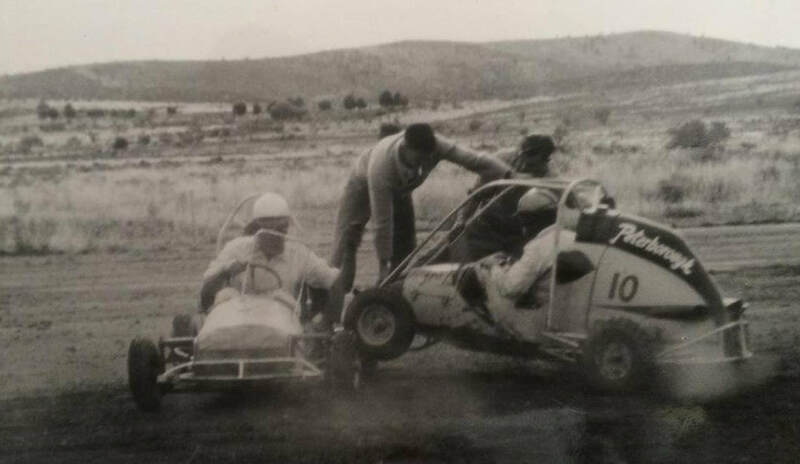 Brian Curtis recalls: Back in my days as an apprentice, In Yunta South Australia, my boss and I were good friends with the late Jim Davis, Who at that time, owned and operated Jim Davis Crash Repairs in Peterborough, Jim raced a JAP 500cc tq, in the days of Jamestown, Peterborough and the North East South Australian tracks at Nackara and Mannahill, Jim is pictured above in the number 10 car and is possibly the first tq with a full roll cage and down tubes, Jim had retired from sport and sold the car before i started my apprenticeship in late 1964 or so. 1965: Brian Curtis at the age of 15 in the ex Kevin Hunt, Bob White, Bill Brown CB18 BSA ZB500 at home in Manna Hill, Brian forged his mums signature to go racing. Photo: Brian Curtis collection. Alan Streader recalls: At one particular speedway meeting the speedway was selling fish to raise money to build a monument in town, At another it was very hot and the publican had a good day with sales, after the meeting he invited the drivers back to the pub for free beers, I suggested that might not be such a good idea with the boys being a bit partial to an ale or two. 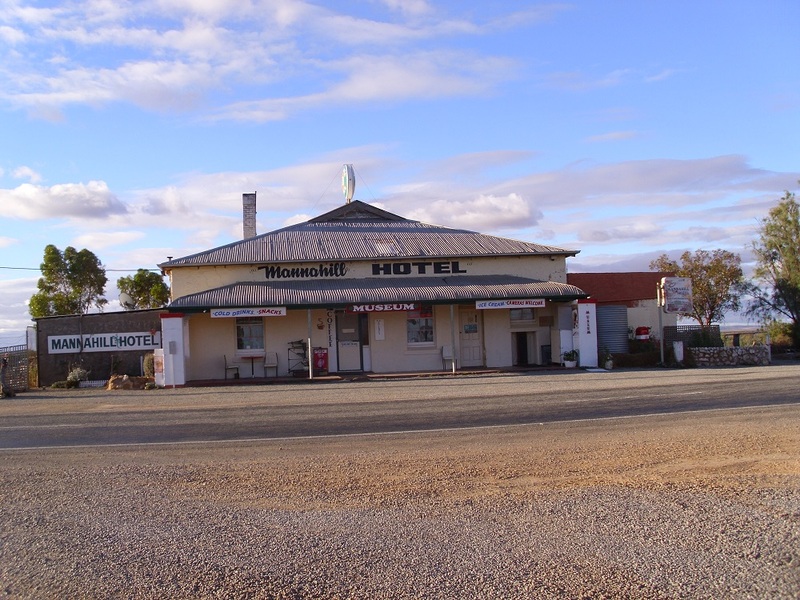 The publican replied, I sold more beer today at the track than the pub sells in a year, who cares, bring em to the pub tonight. Brian Curtis recalls: From memory, The speedway was near to where I have indicated. 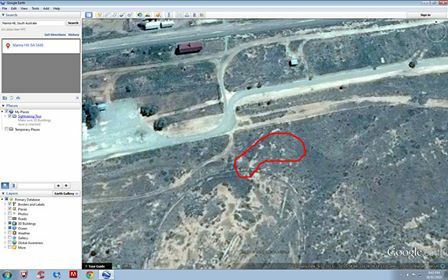 Please bear in mind that it is over 50 years ago and all of the old land marks have since disappeared. The track was hard cinders but some vestiges may still be visible, I am trying to remember by aligning the store and the hotel plus where once a row of five railway cottages once stood. 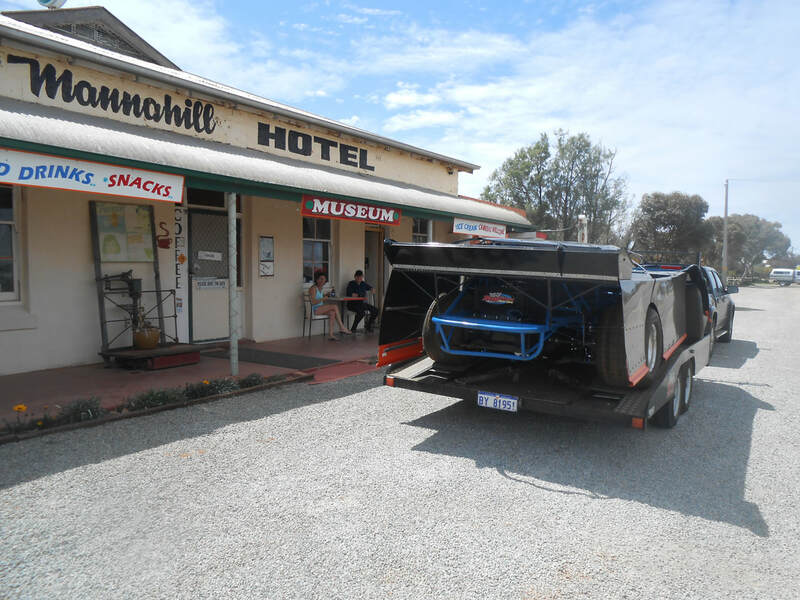 Brian Moyle recalls: I often find myself driving east west and vice verser delivering or picking up racecars, Its allways great to stop in at Manna Hill and catch up with Lady Di the publican at the Manna Hill pub. 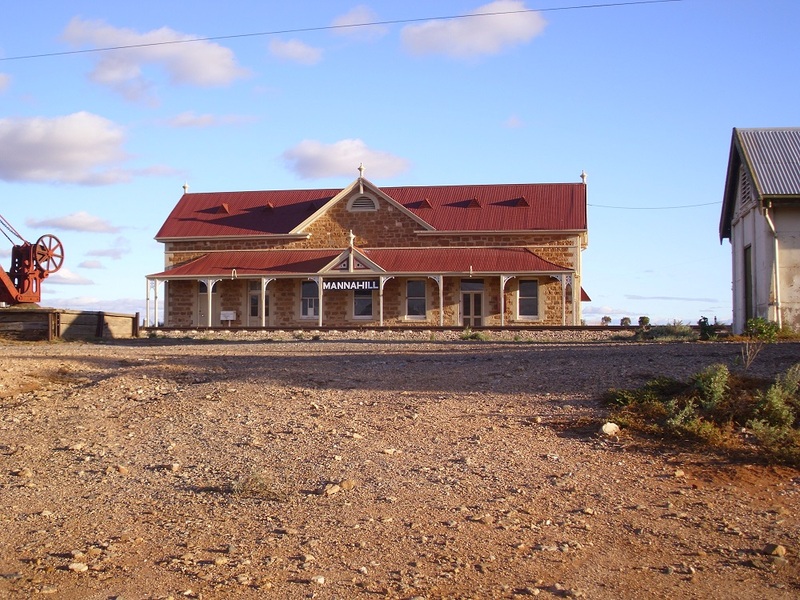 Best described as close to the narrow gauge railway line beside the road to Broken Hill. This ground view photo shows, The track is situated to the left of the station building directly behind the rail crane.